Why this plagiarism case against Deepak Pental? He is not the co-author of the paper you have problems with. He certified the work by a member of his research team K V S K Prasad, who was also once my PhD student. I wrote a letter to Pental in 2004 pointing how Prasad had simply taken away data from my research project to his Young Scientist project. I also said the use of codA gene and related materials was a hazard and that it could have contaminated other material. It was a courteous letter but he did not respond. Instead, the harassment started. So the case against Pental is actually about not following biosafety rules? Biosafety is an important issue. Pental is fully aware of the guidelines. It is obvious from the certificate issued by Pental that Prasad was using either codA GM transgenic lines produced by my research team or fresh codA GM transgenic lines of Indian mustard generated by his own team. So he needs to get permission from ISBC and RCGM for getting seed of codA transgenic lines transferred from my lab to his. As the group leader he should have signed anMoU with me. What has upset you the most? The Department of Science and Technology's refusal to give me the required information when I put in an RTI application. In fact, in 2011 they asked me to withdraw my court case instead of taking action. I am also upset by the signature campaign in support of Pental that misrepresents the case and maligns me. It has been initiated by one of the three members of the inquiry committee which gave a clean chit to Pental without following the rules. They have been spreading false information about why Pental was remanded in judicial custody. It was certainly not for plagiarism, but for charges that include unethical/illegal use of GM Indian mustard (with codA gene) in his lab disregarding biosafety guidelines, theft of codA transgenic lines of Indian mustard and its use. What action has the Society for Scientific Values (SSV) taken on your complaint of plagiarism? SSV asked both Pental and Prasad for their comments. Neither of them responded. However, the registrar of DU responded to a warning received from SSV stating that the complaint would be pasted on their website. You have written to the HRD Minister asking her to clean DU of plagiarism. Has she responded? No. Prime Minister Narendra Modi had promised a clean and efficient government. I expected quick action, but so far I have not seen any difference from the earlier government. This is a serious issue. I know of cases where students are trained by senior professors to plagiarise scientific work. One of these professors, a Pro-Vice Chancellor was himself caught plagiarising the research of others. Our students are talented and should not be led astray. There is a major case of plagiarism involving CISHME when the professor who was guiding the student was not even in the university. Your campaign to expose wrong doings has not been very successful. Yes. The people involved are powerful. They got jobs and rose in the careers through connections, by knowing the right people. Influence is what matters in the scientific world here, not facts. Why are you persisting with this crusade which has cost you professionally? It is making a difference. Teachers and researchers across the country have started raising their voice against plagiarism and unscientific and unethical practices of eminent/influential researchers in India. The JNU teachers’ association recently highlighted issues of plagiarism at their university. I understand teachers/scientists at other places are also doing the same. You say there are shocking instances of academic fraud in DU. An example? 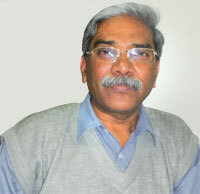 Some years ago, the then Pro-Vice Chancellor C R Babu appointed one V G Gogate as guest faculty to teach MSc students. You would be amazed to know that Gogate had only a senior secondary school certificate and diploma in tanning. After my RTIs exposed this, he just disappeared.